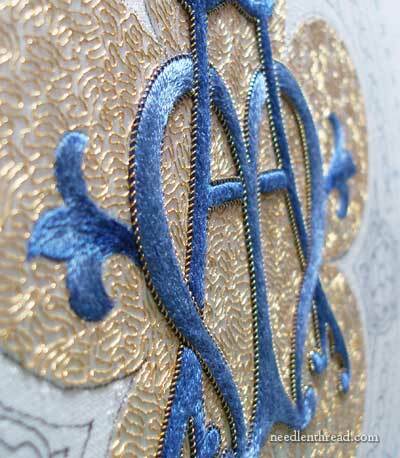 When last we visited the Medallion Project, I hadn’t quite finished the goldwork edge around the long and short stitched monogram. After a little break for a short bout of travel, the first embroidery-related thing I did on my return was finish up the gold outlining. It is finished, and I’ve even moved ahead a bit. Actually, I moved ahead quite a bit… but I am picking it all out today! But more on that (disaster) later! In the photo above, you get a sense of the real color of the blue silk on the gold background. It’s great what a side shot will do! The blues are bright, but deep. You also get a sense of the height of the padded letters and the way the Lizardine fits right up to the side of the letters. Here’s a straight on photo of the completed edged piece. It’s really difficult to get a good straight on photo with the right color and lighting. The background either glares its gold threads into the camera’s eye, or it looks completely washed out. So this one is a compromise. It’s a little dark, but you can see the edging all around the lettering. You might notice that I didn’t outline the fleurs de lys on the sides. I considered outlining them with the same Lizardine and silk twist as the rest of the letter, but when I tried a small bit of it up one side of the fleur de lys, I knew right away I wouldn’t like it. Then I tried a tiny gold thread, but wasn’t thrilled with that, either. So I’ve decided to leave them as they are – I like them best this way, and the edges are nice and clean, so there’s no worry there about having to touch up any edges. I have since moved on to the background of the outside rim, but I made two mistakes – or, better yet, two bad choices. To exacerbate the situation, I persevered in the choices, thinking they would grow on me. In the wee hours of the night last night, while all the world slept and I should have been among them, I could not get the project out of my mind. Tossing and turning, slipping in and out of nightmares involving rabid embroidery scissors and angry needles, I fretted over the decisions I had made. I tried to justify them. I tried to convince myself that it would look ok, once the whole was complete. But alas, I finally gave in! I made the decision to un-stitch. I’ll show you what I did and tell you why I don’t like it. I’ll also admit that it may have worked out fine. But when there’s a nagging discomfort with something on a project like this, I figure it’s always better to go back rather than forge ahead past the returning point, for you may end up very disappointed in the long run! So that’s where we are right now. Wish me luck with the seam ripper! Well what you’re showing us looks GREAT, but so sorry about the other bit. I do absolutely know that feeling of discomfort and knowing that you’ll never be satisfied with it, and the pain of actually having to attack all that work with a seam ripper … If you’re anything like me though, you’ll feel much better once you’ve done it! Just making the decision is a big relief, Anne! Now it’s just a matter of the work! I can’t stand the mystery! I’ll be tossing and turning all night now. I know what you’re saying though. As soon as I hear myself justifying I know I’m going to be ripping. Oh well another creative opportunity. That’s exactly it, Nimue… As soon as you start arguing with yourself over it, that’s a good sign that something needs fixing! I like the fleur de lys as they are also. It reads as more “ornament” than part of the letter to my eye. Rabid scissors and angry needle nightmares? I can’t wait to see what caused such angst, and your fix. Hmm – that last part of my comment reads as if I’m happy you are ripping out. I’m not. It’s just that your explanations of why it’s not working and your solutions are interesting. Sometimes, it’s just better to rip out! So sometimes, it’s a good thing, and I’m glad I did it, though not necessarily glad I had to do it, if you get my drift! 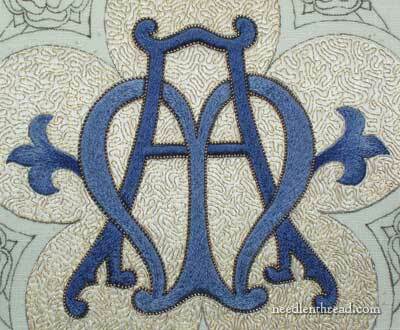 I agree re the fleur-de-lys – it would have confused the eye with the lettering, since the lettering is outlined. May I (dare I) suggest that if you were to go for an outline, you simply used the plain dark couched darker blue silk? Hi, E-R! Yes, that’s a thought! But I’m pretty satisfied with it as it is, so I think my best bet is not to mess with it! But… Who knows…. Maybe later?! Well, it’s a bit thing to fix, because I went too far with it, but I’ll definitely show you all the dirty details! I am living in Switzerland, and I am following your wittings since over 2 years now. I am always very charmed about your fabulous work. Thanks to all what you are showing I toked pleasure to go to a more traditional stitching and to live more and more by side the cross stitching. My English is not very good, but I just wanted to thank you for all this big amount of knowledge that you are sharing with us. Thank you, Brigitte! I am so glad that you enjoy Needle ‘n Thread! Okay, that’s it, I’m quitting my day job and playing around with silk and linen and gold all the days of my life. LOL! Well, I hate to say it, but that’s pretty much what I’ve done! Well… Sort of! Boy, I didn’t know anyone else got as riled up about their stitching as I did. I too have tossed and turned about whether to do this or that on a piece and I’ve gotten up in the middle of the night to work on it, too. And I’ve done my share of “unstitching” ribbit…ribbit. I’m glad you did get some sleep. A clear head helps when making these kinds of decisions. You may have a whole ‘nuther perspective on it now. “A short bout of travel” sounds almost like a disease. I hope it wasn’t unpleasant. The medallion looks just lovely with the lizardine, and I agree w/ not outlining the fleur di lis. They aren’t padded, are they? I’m sure you made the right decision about picking out the embroidery, after all, you did manage to get to sleep. I’m looking forward to seeing it. It was sort of like a disease! I was happy to get home – especially after driving through the very bad storms that morning in Alabama & Tennessee! who shot jr is nothing as a cliffhanger compared to what you dish out…..lol. i already check your site before i even check email so i guess it can’t get any more obsessive….but what the heck i enjoy your site so i guess i’ll stay around and wait for the next chapter. Hi, Sharyn – well, I hope you aren’t disappointed! I didn’t end up taking out the part I initially thought I would, but I did end up taking out some other stuff! So there will still be some picking involved! Very pretty! I really love the background here – so nice to see it finished. About the fleur dy lis; maybe you can try using small gold beads individually applied, round or tube bugle beads. I have done that on the few (and very rare!) padded designs that I’ve made, and found them to be flexible in application placement. Anyway, the silver and gold looks absolutely stunning – a one-of-a-kind treasure. Is it a commissioned item? What will you do with it? Hi, Laura – yes, if you read through the back story, I included the information on what it’s for… It’s a commissioned piece, and it’s for the back of a vestment. My deadline is April, but technically, it doesn’t have to be finished until June. But I need to get it done, so I can get on with other stuff! It looks stunning! I love that side picture you showed us. The colors are elegant, bright and the outline is very pretty. I am looking forward to more updates. But if this new passion of mine (crewel) will result in nightmares where I’m haunted by ‘rabid embroidery scissors and angry needles’ I’m out. All out! I’ve just been advised by two quilting friends to use my seam ripper on a handpieced (yes, made by hand!) quilt top and make a new one (yes it was obviously that bad!) – I can’t cope with any more nightmares. Wohoo – some days are just not good. Funny, Rosa! Well, to make matters worse, I went out to view it again this morning, and now…. Now I’m having second thoughts! I think I’m going to leave it. Mary, you are going to leave it?? At least – if you rip it out anyway – you might end up being extremely proud of your stitching like I am: Last night I spent an hour ripping my quilttop and I found that it is very well sewn with lots of tiny, regular and tigth stitches – it took ages!! I too am a fan of ‘the process’ and the challenges in it, so it’s nice and good to learn about the up’s and down’s of a project. I am enjoying following your progress so much. I too like the fleur de lis without outline. I love that you share your “mistakes” with us. We get to learn from them without having to make them ourselves. 🙂 Following your progress is teaching me so much. Mary a great fright ensued when I saw the words pulling out I could not believe you meant the monogram. Thankfully rereading I got the jist. The side view shows the work really well and it is very lovely to say the least. As you are on the ground you are the one to know about the pulling out of the new work and if it wouldn’t work. I think we the audience are just happy to see every stitch you do and share your thoughts. You are going to reveal your plan tomorrow aren’t you? At first I read your blog and was afraid you were going to rip out the lizardine or the gold stippling. What a horrid thought and job. Then I read again and you are fiddling with the outside rim. Whew. OK but I’m still waiting to see what you’ve done and undone. I’m doing a bit now and due to my inexperience, I stitched an area with French knots. But there was too much background showing but I wanted some texture. Thought: I’ll just fill in with stippling in another color. Believe me – that is a very stupid idea. I’ve learned my lesson. Whoops… The update will be this Friday! G’day Mary, I’m sorry there’s a problem but happy there’s a solution. It’s all learning for me too. Good luck with it Mary. Cheers, Kath..
You are kidding about the seam ripper, right? Aren’t you able to reuse at least some of the thread from your inadvertant choices? Scary to think of all that silk ending up in the trash bin. Good luck on your next go round! Actually, it was just a little bit, Karen, on the border, but I didn’t end up picking that particular part out after all. Another little part got picked, though… Not a big deal, but some instructive bits in there, nevertheless!